Buy a set of deflectors ang get free hood protector from Stampede! - Ford F150 Forums - Ford F-Series Truck Community. Buy a set of deflectors ang get free hood protector from Stampede! As an insatiable outdoorsman you want to give your truck only the best from all the sides, but not always you can do this at once. Luckily, Stampede knows how to help you out. 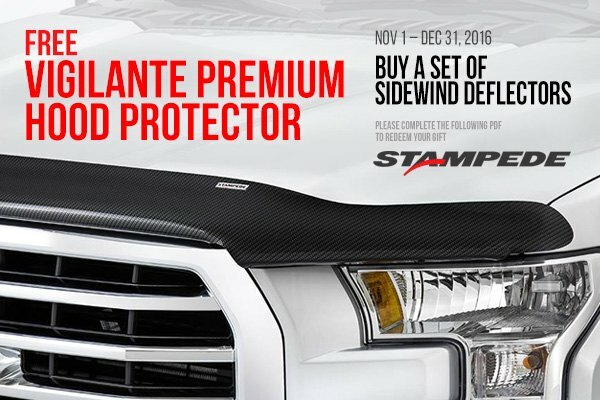 Purchase a Set of Stampede Sidewind Deflectors and get FREE Vigilante Premium Hood Protector of the same color. This limited time offer is valid from November 1 through December 31, 2016. Stampede Sidewind Deflectors feature strong, rugged construction and advanced design. They are UV and scratch resistant, and designed to protect your valuable truck from any road debris. You can mount them without any hassle using included 3M tape. Accent the style of your truck and keep its functionality on the highest level with Stampede Accessories at CARiD! Cover your towing needs with Curt and save on shipping! Quick Reply: Buy a set of deflectors ang get free hood protector from Stampede!